Pat Montandon - the San Francisco writer, hostess, media personality and peace activist immortalized as the free-spirited socialite Prue Giroux in Armistead Maupin's Tales of the City - has published a new memoir. 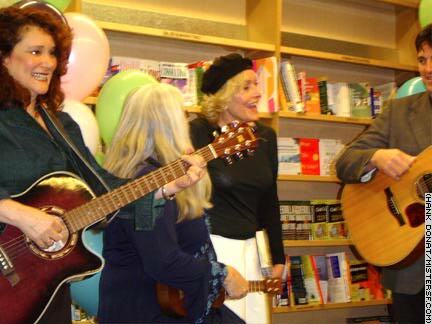 Launching "Oh, the Hell of it All" on the eve of closing night at Cody's bookstore on Stockton Street, Montandon, 78, shared her story of alleged betrayal in 1980 by then-husband Al Wilsey and then-best friend Dede Traina and of the subsequent vision that led Montandon to rededicate her life to children and the peace movement. << Pat Montandon welcomes family and friends. MisterSF.com's Coverage of Pat Montandon's "Oh, the Hell of it All"